Hedgehogs are known as ‘the gardener’s friend’ as they eat slugs, beetles and caterpillars and do no damage to plants or crops. Please help a hedgehog this autumn, by making a simple hedgehog house from pruned tree branches or logs, even an upturned crate will suffice. Construct an entrance tunnel from wood or bricks to stop badgers and foxes disturbing the hibernating hedgehogs. Cover the top of the shelter with slates, tiles or plastic sheeting in order to keep the rain out. Site the hedgehog house in a secluded spot, under a hedge or evergreen shrubs, and with the entrance facing away from cold northerly winds. Finally, don’t tidy up the dead leaves and twigs in your garden, as hedgehogs are proper little Laurence Llewelyn-Bowen’s and like to do their own interior decorating. Look after hedgehogs by not using slug pellets and ensure that garden ponds have an exit slope for any hedgehogs that inadvertently fall in. 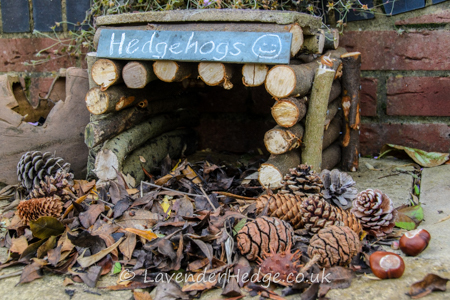 Here is a great present for wildlife lovers or gardeners keen to attract hedgehogs to their gardens; an attractive ready-made wooden hedgehog house, complete with a slate roof. Previous Previous post: Sunflowers: To Deadhead or Not to Deadhead?